Driving home from work yesterday, I saw this as I exited the freeway, and couldn't figure it out at first. Once I got closer, I figured it out. WKTI (a local FM radio station) and the American Cancer Society teamed up to run Bras for a Cause, an event to support Breast Cancer Awareness Month. 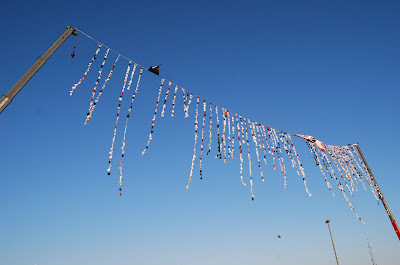 Bras were strung from a cable suspended between two cranes, creating an attention-getting display. Donated bras will be professionally cleaned and donated to women's shelters in the area. I would have never guessed those were bras....a wonderful cause to support!